The Good, the Ugly and the Unusual! Conservation is a hot topic right now and during the summer, the media has been bombarded with images of cute baby animals that have been born during these warmer months. More and more people are becoming increasingly aware that more needs to be done to help these incredible animals before we lose them from this world forever. But is this enough? Is saving pandas, tigers, sharks, elephants – to name just a few – enough to safeguard our planet for the future? We need to see beyond the cute and cuddly and begin taking notice of those not so pleasing to the eye, the weird, the wonderful…. Dare I say it…. The beautiful. It is these animals that play a crucial role, further down the food chain, which will ensure a greater chance of survival to those classed as the magnificent ‘charismatic megafauna’. The Deep prides itself on conservation and education and during your visit you will witness some stunning fish and striking sharks, but you will also encounter some odd looking creatures. Hidden between the rocks and in the darker depths there is a whole other world waiting to be explored. Here we meet some of the ‘ugly’ animals of The Deep, and find out why they are not so ugly after all…. Sawfish are a type of ray belonging to the same group of animals as sharks, called elasmobranchs. These strange looking rays are exceptionally specialised in their feeding techniques and use their impressive toothed rostrum to sift through the sand in search of prey and can immobilise them in an instant with one hard swipe. This large predator is listed under Appendix 1 CITES (the Convention on International Trade in Endangered Species of Wild Fauna and Flora) so all international trade in this species is now banned. Slow growth and low reproductive rates along with a high age at reproductive maturity make this species highly vulnerable, even though promising conservation efforts are underway, population recovery rates will be slow. This bizarre looking amphibian is related to salamanders, however it has the unique trait of retaining its larval features through adulthood – a state called neoteny. Axolotls are probably the most studied of all salamanders due to their remarkable ability to regenerate lost body parts! On top of being able to grow back their limbs, they can also rebuild their jaws, spine and even their brain without scarring! They can only be found in the lakes and canals of Xochimilco, Mexico. However habitat loss, urbanisation and the introduction of invasive species are pushing them closer to extinction. An amphibious creature, this fish can walk on land using its specialised pectoral fins during low tide. It breathes using gills and through the membranes of its throat and mouth. What’s really cool about these guys is the ability to roll their eyeballs in their specialised water-filled sockets to refresh its face and gills with oxygenated water allowing to breathe on land! With 80 identified species, Parrotfish come in an exciting array of colours, however it is their unusually shaped mouth and behaviours that place them here. Scraping algae and food from coral reefs, they ingest a lot of rock….. Passing through their specialised digestive tract with ease, it is excreted as fine white sand. Yes – The stuff we like to sunbathe on! They also have another trick up their sleeve, they tuck themselves into bed at night in a cosy mucus sleeping bag. This mucous sac surround them completely and protects them from parasites and predators through the night. Coral reef loss and declining habitat conditions are particularly worrying for some of these corallivorous excavating parrotfishes. They play a major role in reef dynamics and sedimentation. This is the largest of the Grouper family and get its name from the dark blotches on its body that look at bit like the eyes on a potato! These spots become much more pronounced when they ‘blush’, this occurs when they are excited or threatened. Gaining a maximum length of 2 metres long, these huge fish can actually be pretty friendly, but over confident at times! Their huge mouth can open considerably wide and is able to swallow prey in one large gulp! This aquatic species lives in the slow flowing streams and ponds in the tropical rainforests of South America. Hiding amongst the leaf litter on the river beds, it is perfectly camouflaged, permanently splayed out, it looks exactly like a flat leaf! However its appearance isn’t the main reason it is placed in our list……. Frogs and Toads have some fascinating adaptations for breeding, however the Suriname toad surely takes the prize for the most cringe-worthy! After mating the male sticks up to 100 eggs to the females back and fertilises them. Gradually the skin on the females back begins to swell and grow, engulfing the eggs, keeping them safe whilst they incubate and develop. After 3-4 months the tiny toadlets hatch by ‘erupting’ through the skin on the females back! Ok, this fish is pretty cute, but there is no denying that it’s an odd ball! (Pun definitely intended!) Everyone knows that Pufferfish have the ability to inflate their body, filling with water and sometimes air, into a ball up to twice its size when threatened, making all its sharp spines stick up and out. This is a very stressful situation for the fish, so I would definitely not recommend encouraging this. Despite its spiky exterior, this fish has a fun and quirky personality – but is highly venomous! Opportunistic feeders, these guys will eat most things. Preferring small shellfish and crustaceans these animals are vital for keeping the predator/prey balance in check. We all know of Scorpions and Tarantulas, but not many have had the pleasure to come face to face with a Vinegaroon! This nocturnal creature has pretty poor eyesight so relies heavily on its whip-like tail and its long first set of feeler-like legs to find its way around. This animals, although it looks mean is pretty harmless to humans. Don’t get me wrong its claws can deliver a painful pinch, however this isn’t the only trick up its sleeve for defending itself! Its stingless tail has a special gland at the base, capable of spraying an acidic mist toward a potential predator. Made up of 85% acetic acid – or vinegar, as we more commonly know it – giving it its common name, Vinegaroon. Imagine the surprise having that sprayed in your face! The Deep and Bristol Zoo Gardens have worked with these animals over the years and together have achieved the first documented successful breeding of the Vinegaroon within Zoos and Aquariums in the UK. Neither a wolf nor an eel, the Wolf eel is in fact a fish! 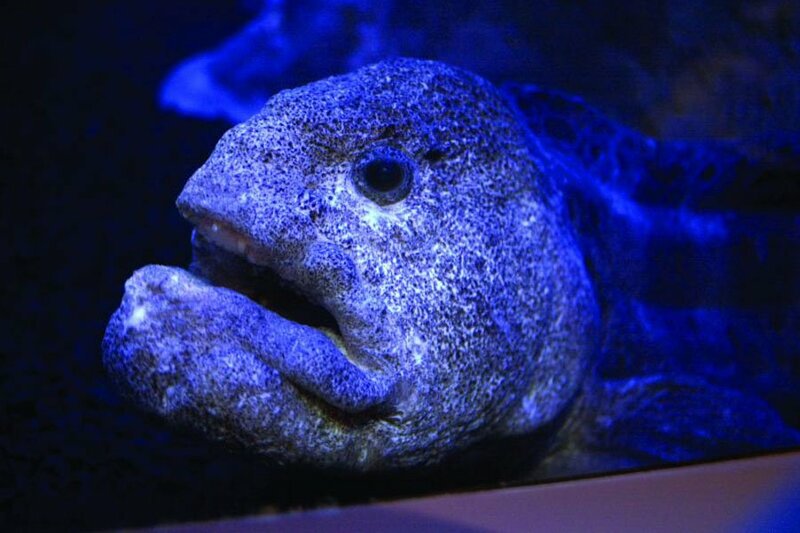 The Wolf eel is one of 5 species in the endangered Wolf fish family. These animals are relatively shy, however, they have one of the strongest jaws in the animal kingdom and their fang-like teeth are designed to deliver a nasty bite. This incredible feature is perfect for eating their favourite food – sea urchins and crabs. Sea urchins multiply fast and this prime predator is exactly what is needed to keep their populations in check, without them, large populations of urchins would destroy their sensitive ecosystem. Wolf Eels also have another quirky adaptation. Their blood contains a special antifreeze factor, keeping their blood fluid at temperatures as low as -30°C!! This odd looking Catfish comes from the tropical rivers of South America. Its large pouty mouth and long sensitive whiskers (barbels) are prefect for sifting through the sediment in search of prey and food items. But its unique looks come from its ancestry. It dates all the way back to the Palaeozoic period and is easily distinguished by its armoured plates scaling along its lateral line. This quiet and shy fish is almost contradicted by these specialised scales, with razor sharp barbs at the tips, this is not a fish you want to mess with. The Ripsaw catfish takes a long time to reach sexual maturity, and being slow to reproduce, places them in danger of dramatic population decline.